The Archer's Diary is much more than just a website. It consists of several systems to take the pain out of your event management. A central database where all permanent records are stored. This database is referred to as "The Repository". This website which is a "front-end" to the repository. "Club Manager" which is an application that club recorders can use to manage their events and do all of their processing. iScored.today which allows archers to enter their scores live. 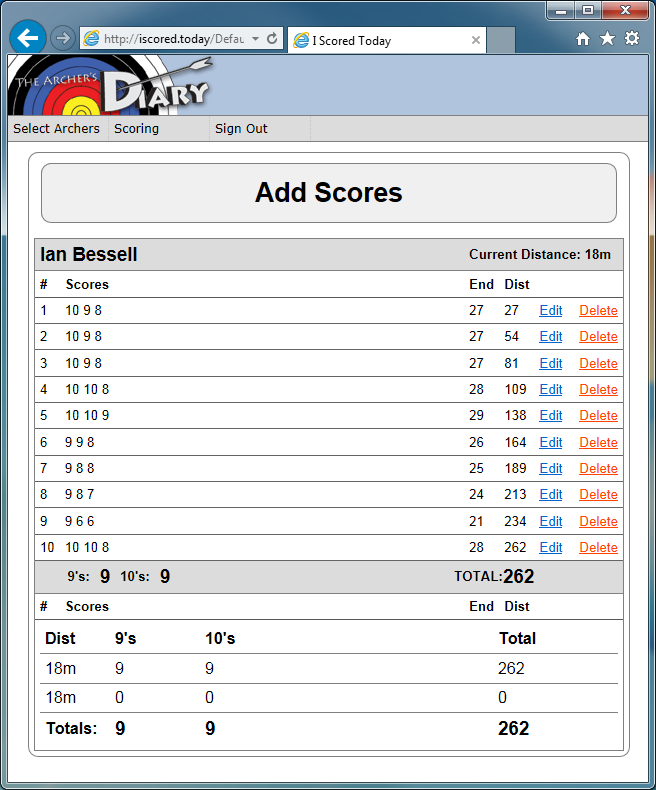 "The Archer's Diary" which is a personal scoring application suite that members will be able to use to record their own practice results in. This application suite is not currently publicly available, but will be released in the very near future. You start with Club Manager. Club Manager lets you maintain your list of members and set up any club specific rounds that you might have. You can then create an event and enter the scores shot for that event. Alternatively, you can get the archers to enter their scores live through iScored.today. Once the event is complete, you can then process any claims or records. The event is then published to the repository to create a permanent record. RGBs can also use the software to maintain and process their list of state records as well as issue state-level awards. 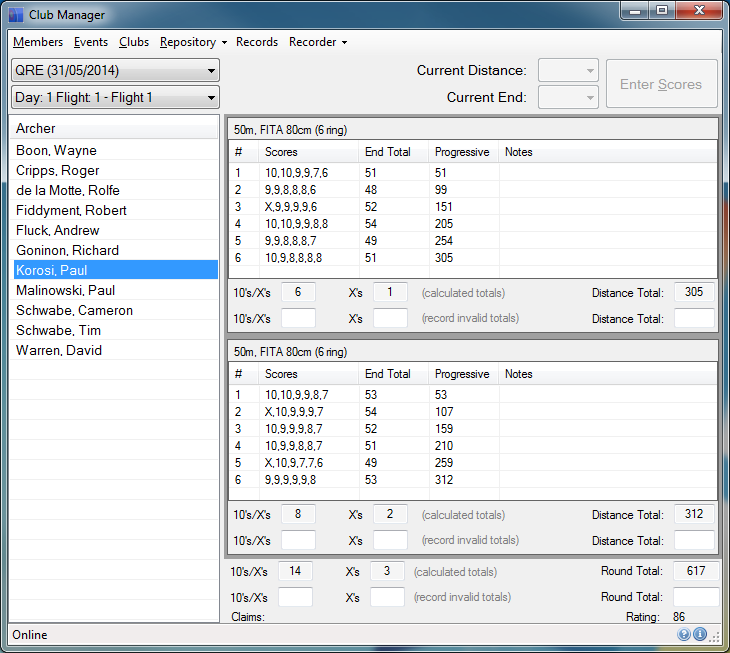 When you create an event in Club Manager, you have the option of simply displaying the results from all flights shot, or you can create "Scoring Groups", which allow you to combine the results from one or more flights and have the event placings automatically calculated. You also have the option of doing handicap flights, with the system calculating and maintaining archers' handicaps. Here is an example of a scoring group in action. 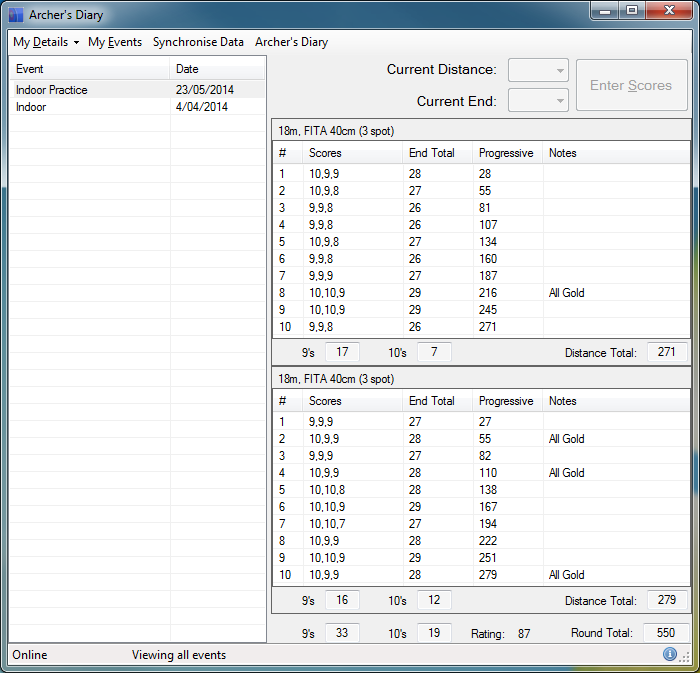 iScored.today is the electronic scoring software for Archer's Diary. It allows any archer with a smart-device to select the archers to score and then enter scores live to the system. The live scores can be viewed online and there is also an online manager so you can make any last-minute alterations to your event. Once scoring for a flight is over, the manager allows you to lock scoring to avoid any inadvertant changes to the scores. If you would like to find out more about these systems, feel free to read through our help files.